Last week i got banned from the Reddit polyamory page and lost my friending privileges on Facebook. Neither of these were intentional results, but rather my failings to read the appropriate user manuals for operating these long lever technologies. My relation with Reddit has been troubled from the start. They dont actually want users like me, who are posting content (my blog and other stuff) more than they are commenting on and reading the posts that other people have put up. So when i put up on the polyamory subreddit the link to the clever polyamory comic by Tekvah, i exceeded some unpublished magic ratio of posts to comments and got permanently banned. Facebook was more forgiving. I was emailing participants to the new, improved Loud Love event next weekend. Because i was not current FB friend with all the people i was writing i tripped some spam protection filter and got banned from emailing non-friends but just for a week. i have occasionally said “We know that community is the answer, we are just trying to figure out what the question is.” There is a parallel joke about social networks, we recognize there is incredible potential, but tapping it remains oft illusive. Though this week i have be seeing several likely possibilities. When researching the March on Monsanto for the wikipedia entry i discovered that it was only on Feb 28th that Tami Canal by herself posted the call for the march, less than 3 months ago. Today over 400 cities in 55 countries have RSVPed for this Saturdays march, with basically no large group behind her and no advertising budget, she launched and idea that over a quarter million people are going to be involved in. Every city march has it’s own Facebook page, the feed for which appears to often be a significant organizing forum. Here are two different groups which have been pulled into this irresistible ideas, since it started less than 100 days ago: Anonymous and the Hollywood elites. Another worthy effort to harness social media is one to reform social media itself. 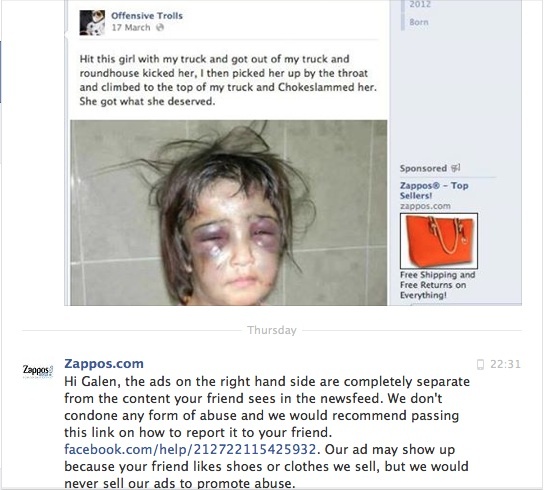 Facebook has a violence against women problem and the advertisers are basically ignoring it. What was Amex thinking when they bought this ad space? There are a number of groups which are working on this campaign, the one whose website and tactics i have appreciated is WAM, Women, Action and the Media. So the casual observer might think, “Oh, Amex places lots of ads, they were just not paying attention and this one got away from them, they dont really support this awful sentiment and they will quickly correct the situation once it is pointed out to them.” As is so often the case with casual observation it is dead wrong. Amex and other advertisers pay incredible attention to where their billions in ad spending goes. They are targeting extremely specific audiences with their products and services. Amex and others wants the audience that finds this image funny. And until now they have thought there was no cost to courting this group this way. They go on to explain that they are calling on FB users to contact advertisers directly, which they have made it easy to do using twitter. The response on the part of some companies has been swift, in just 4 days 7 companies (including Nissan UK and ZipCar) have agreed to stop advertising with Facebook. And Facebook itself has pulled the above page because it violates their terms. Problem solved, right? You know better. This image stays up (while a picture of a happy mom and baby breast feeding will quickly be pulled down by FB censors) because some people find it funny. Facebook explains. Apparently, Facebook has quite a good record when it comes to policing hate speech against Jews, Muslims and gays. But when it comes to women, our misogynist humor is so pervasive they seem largely unable to assist. But stay tuned, these gals and guys are sharp and this long leaver is strong. i am betting there are many more wins in the coming months on this issue. You can be part of it right now.